Memorial Day weekend 2012: Saturday morning 3AM. It’s raining so hard I think the skylight in my bathroom is going to implode. Here we go again,. Best laid plans of mice and men, right? I thought I was going to hit a homerun over here this weekend but I’m getting the feeling that’s not going to happen. I went back to bed. I actually fell back to sleep so Saturday wasn’t so bad after all. I did go over to the house late Saturday with my son Ethan. He cut some rebar up for the footings for about an hour while I did some miscellaneous stuff. It was productive. The water was pouring into the site. The footing drain is working like a charm though. You would never know that it rained like over an inch here. Water running down the hill and into the site. Best part of Saturday: We all went to see “Star Trek:Into the Darkness”. It was great. Everyone in my family liked it. We all highly recommend it. You gotta love Spock. I’m supposed to be building a Hobbit house. Ok, so Saturday was a bust. How did we do Sunday–> much better. I started the day insulating the footing forms. I’ve never insulated footings before so I wasn’t exactly sure how to approach it. I just put a general note on the drawings about insulating the footings. I thought that if I got a little too detailed it might get a little to confusing. Like I said, I didn’t even know how I was going to do it so why bother. Experience has taught me over the years that once you start, usually a good idea becomes apparent or somebody comes up with a good way of doing it. 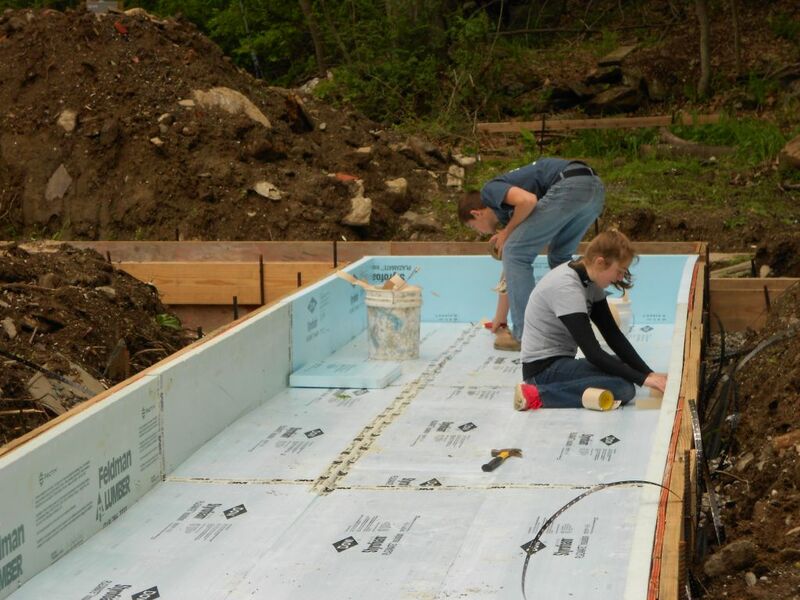 Why the heck are we insulating the footings to begin with? That’s a good question. The dwarves of the first age began experimenting with footing insulation and eventually passed their knowledge of footing form insulation on to the Hobbits. So that’s why I decided to do it. Pretty simple. Behind door number three we find the real answer to this question. This is one of the main facets for passive house compliance. No thermal bridging. 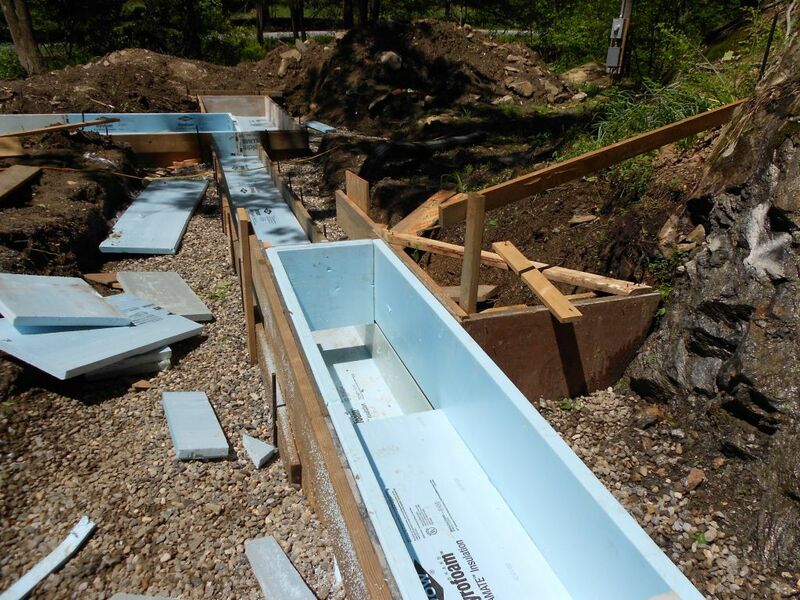 If the footings are not insulated they could create a huge thermal bridge into the house. The short version: This would allow the warmth of the building to pass through the footing and into the cooler soil during the winter months. The same holds true for the slab. That will be insulated as well. What we are trying to create here is a huge thermos. Whatever is in the thermos be it hot or cold will have no egress to escape or be influenced by the temperature outside of the thermos. Another positive of footing insulation is it prevents condensation from forming on the walls. Just like a cold drink on a hot summer day water condenses on the outside surface of your glass where the cold glass and warm air meet. The same holds true for your basement. That’s one of the reasons why people have moisture issues in their basements. So back to Sunday. How do I begin? The Hobbit house we are building is basically two long parallel walls that are supporting a concrete arch. So it’s important that the footings for these walls are insulated. This is where I began; keeping an eye on the thermal envelope of the structure is critical. Here is a picture of where I started. Notice the string line. That line represents the outside edge of the slab. I need to have my insulation on the outside of that line. (Just so you know I transferred the batter board lines to the footings…it makes things easier). It’s hard to see from this angle but the line is right over the inside edge of the foam. Main footing insulation.I used 3M 8067 flashing tape to hold the corners togther. There really is so much to talk about and I know I’m going to leave something out. There are two different types of insulation that we are using right now. 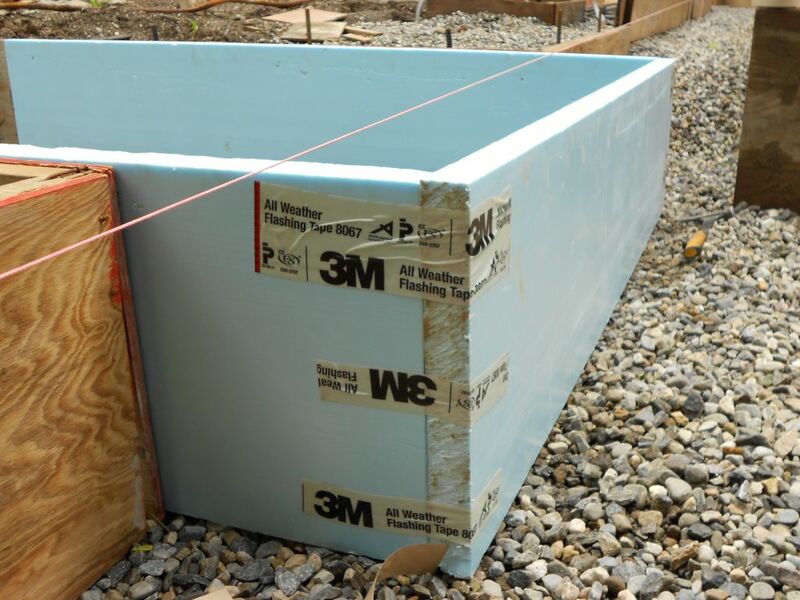 The insulation that is directly under the footings is 60 psi (pounds per square inch) extruded polystyrene or XPS insulation. This is critical because the weight of the house is going to be bearing on this insulation. If you put the 25 psi insulation in there it might crush which would lead to settlement issuses. 60 psi translates into 8640 pounds per square foot of footing. I own a Toyota Corolla. It weighs about 2700 pounds. So just for perspective you can park three Toyota Corollas on every square foot of this footing and the insulation will not crush. Impressive…most impressive. (Say it the way Darth Vader said it in the Empire Strikes Back and you’ll get my meaning.) The other insulation is 25 psi XPS which I used on the sides of the footing. Here there is really no strucural issue it is solely thermal. Once I had the tricky parts done the hired help arrived and we went into production mode. Sides first then the bottoms. The next step (which I’m not sure was entirely necessary) was to tape the seams of the insulation. At the very least this keeps the individual pieces together and hopefully keeps moisture out if I complete the rest of it properly. I don’t know if any passive house people are out there but some feed back would be nice (and educational as well). It was pretty windy out on Sunday and boy is this tape sticky. Once Georgia and Terence got going though they motored through it. Just a quick note on footings. I don’t know if you’ll be able to see this from the picture I took. The next picture is of a step in the footing. 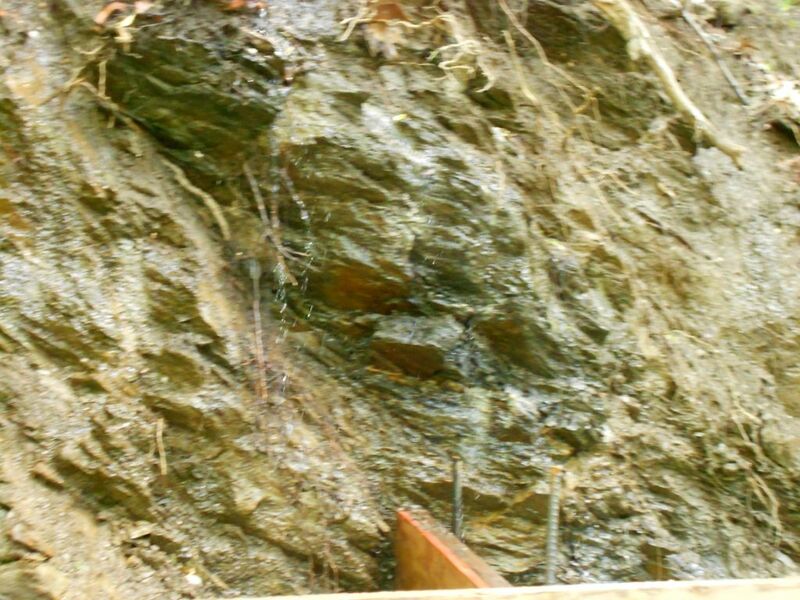 This occurs when there is an elevation change in the path of the footing. When I was digging the footing on the East side I hit solid rock. That footing is about 16 inches higher than the footing on the west side. To connect the footings I had to step it down from east to west. I’ll try and take a better picture later on. When we lock up the footings prior to the pour this will be a critical location. This has blowout potential written all over it. We will pour it a certain way when we make the pour. Monday was my wonderful wife’s birthday. I did a small amount of work in the morning with Ethan and then spent the rest of the day with my lovely wife and family. Grilled for the first time for dinner. Burgers were excellent. Happy birthday Jo! …Love, Jim. 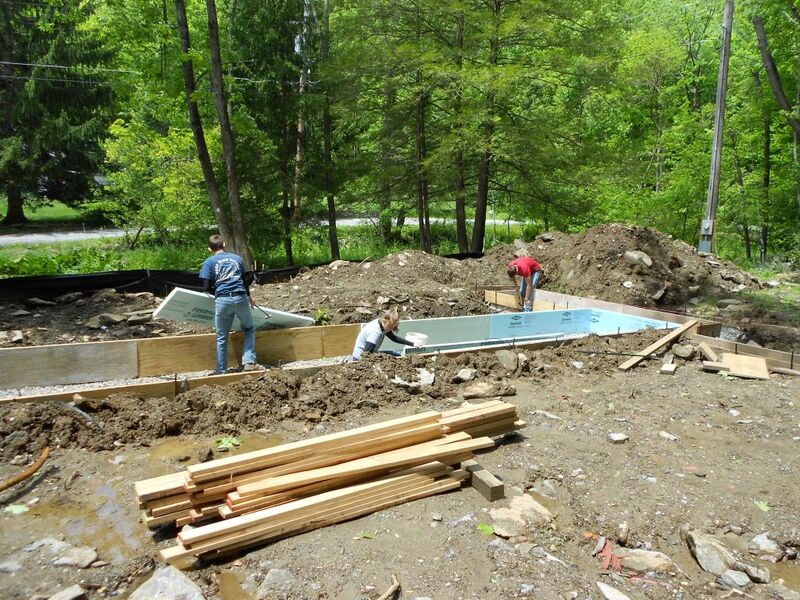 Footings Continued: Are these things the hallways?